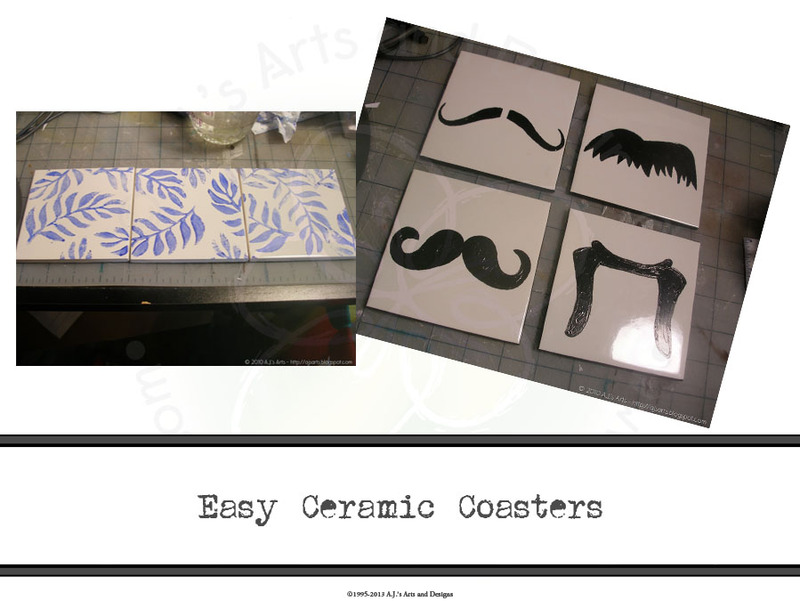 How To Make Ceramic Coasters (Easy) | Who Are You Calling Crafty? I am really into coasters this Holiday Season but there was no way I was paying $20 for 4 coasters (beverage NOT included). 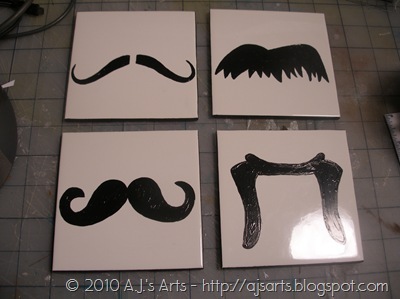 So we went to my favorite supply store (Home Depot) and bought white ceramic bathroom tiles ($0.16 a piece). I once again am using PLAID Enamels paint (leftovers from last year) the more I use these paints the more I like them. I only have 5 colors: #4032 Licorice, #4056 Frost White, #4006 Engine Red, #4017 Lemon Custard and #4025 Cobalt. I have had color theory so I can pretty much match any color I need (it is a pain but it works). I plan on getting more colors some day but right now I really don’t have the room or the need for a ton of colors. 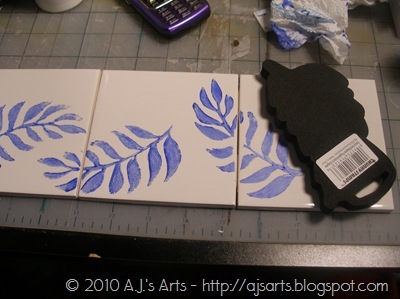 I also find that using a solid color such as black or blue works so much better with stamping. 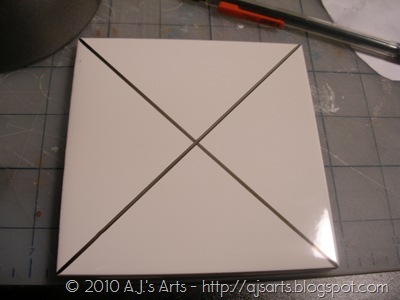 First you need an image or and idea – I will be showing two different coaster sets at the same time to demonstrate the different techniques. This tile I took a ruler and found center by drawing an X across the tile. These tiles I laid next to each other and started stamping. 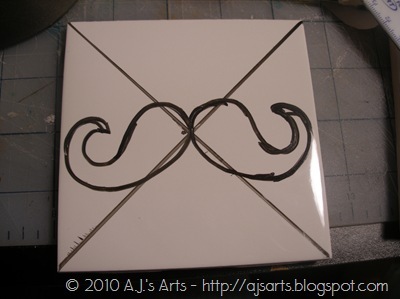 I drew the design in this case a mustache with a dry eraser marker. 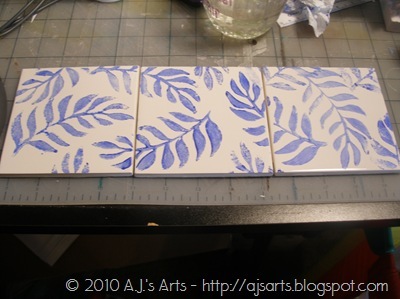 Finished Stamped tiles. 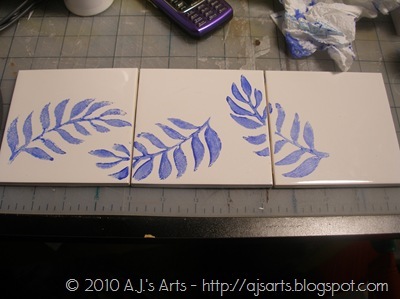 I did go over the stamps with a brush to make it darker.